The item you receive may not be identical to the item pictured. Autograph size & location may vary. 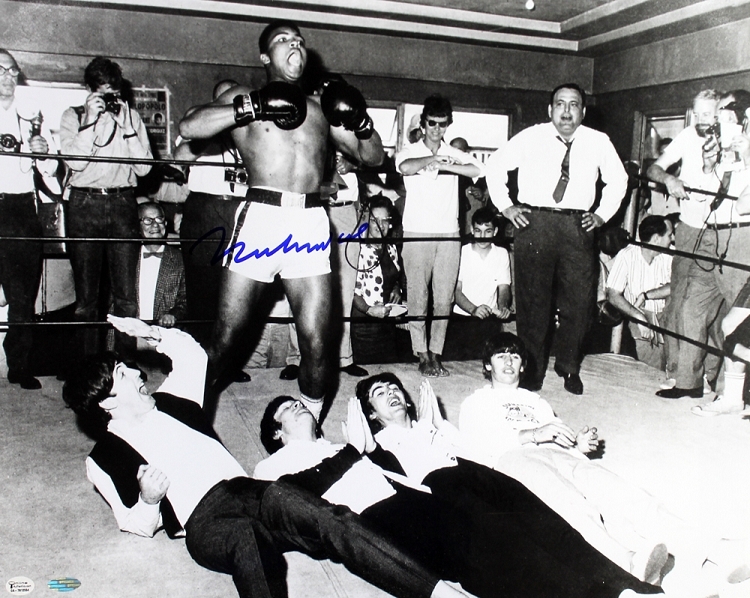 Muhammad Ali personally hand signed this historic 16x20 photo picturing him standing over The Beatles. Each autographed photo includes authentication from Steiner Sports. On February 18, 1964, The Beatles were taken to Miami's Fifth Street gym to meet Cassius Clay, who was training for an upcoming fight against heavyweight champion Sonny Liston. This historic photo is a true merging of sports and entertainment icons and an incredible piece to add to your autograph collection. Muhammad Ali is known as one of the best heavyweights in the history of boxing. Ali won a gold medal in the 1960 Olympics in Rome in the light heavyweight division. He is the only three-time lineal World Heavyweight Champion. The 1990 Hall of Fame inductee ended his career with 56 wins out of 61 total fights. 3000 points will be rewarded to you when you buy this item.